You can find cookie recipe jewels like this one if you carefully study product packaging. If you know where to find them, these “Back of the Bag” or “Back of the Box” recipes let you score big. They are created for specific products by manufacturers. For instance, confectionary giant Hershey’s developed this recipe, sometimes known as Chewy Toffee Almond Bars (or other almond-toffee names) as a vehicle for its popular Heath Bits O’ Brickle Toffee Bits. Preheat oven to 350ºF. Use vegetable spray or butter to lighting coat the sides of a 13 x 9 baking pan. Or line the pan with foil and allow the edges to drape over the ends and coat the lining with nonstick spray. Set the pan aside. In a medium bowl with an electric mixer on medium speed, beat butter and sugar until the mixture is light and fluffy. Gradually add the flour. Combine until well blended. Press dough evenly into the prepared baking pan. Bake crust 15-20 minutes until edges begin to brown lightly. Meanwhile, combine toffee bits and corn syrup in a medium saucepan. Cook over medium heat, stirring constantly, until toffee bits are melted (about 10 minutes.) Remove the mixture from the heat. Add ½ cup sliced almonds and ½ cup shredded coconut. Mix thoroughly until all additions are coated. Spread almond mixture evenly over crust to within ¼ inch of the edge (it will spread to the edge while baking.) Sprinkle remaining almonds and coconut on top. Return the pan to the oven. Bake bars for another 15 minutes until coconut begins to turn golden brown. Remove the pan from the oven. Allow shortbread to cool completely. Slice into bars. Use a spatula to remove cooled bars from the pan. The bars are best when you use butter in the cookie layer. That way, they taste more like shortbread. You can substitute any kind of toffee for the Bits O’ Brickle. Chop toffee coarsely so you can measure the right amount for the recipe. 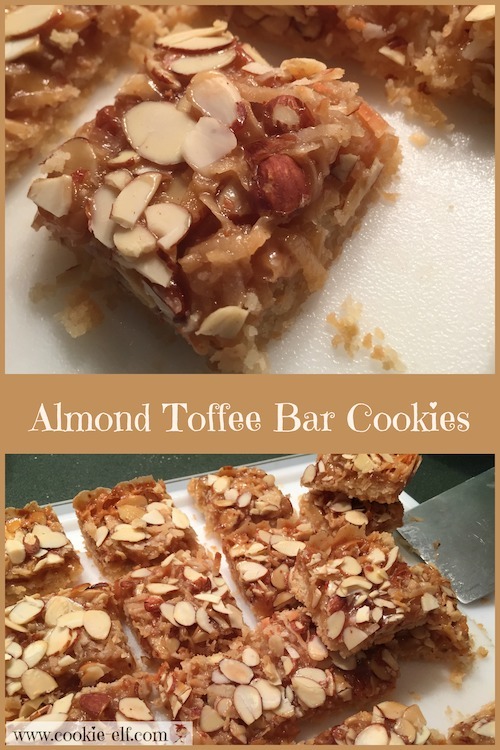 See more ideas on our Bar Cookies Pinterest board.